Dry erase paint is a fantastic addition to any office space. If you want to nurture collaboration and a sense of community in your office, simply having a wall where employees can freely wax lyrical with a marker pen is an excellent step to take. (Head here for a round up of some of the best dry erase wall paints available). However, if you remain unsure on whether a wall devoted to the scribbling’s of your staff is the right move for your office environment, the following 5 benefits may well help you change your mind. One of my favorite reasons for having a dry erase wall at work is the fact it can become a vehicle of self expression for those that use it. All that’s required is dry erase paint and a marker – the end result for your organization is a more personalized working environment. When an employee is liberated so that anything can be written on a wall, (be it work-related or personal, or just some fun doodling), you are increasing the channels of communication. Just a momentary piece of self expression, (most markings are quickly deleted to make room for the next person) leads to a happier employee. In a work context, the increased communication normally ends up in greater efficiency and a better flow of ideas. Gone are the days where you have to use a small whiteboard for brain storming. With walls and surfaces of a meeting space covered in dry erase painted; the room becomes a place to exchange ideas in an entirely new way. Everyone can be up on their feet. The increased engagement far surpasses the traditional role of one person and a marker stood beside the board with people offering ideas. 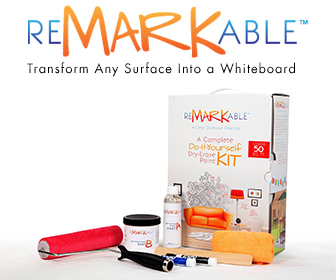 Now everyone can unleash their ideas with the enjoyment of scribbling directly on the wall. The results may seem a little frantic at first, however that’s what a good brain-storming session should be. The role of a good project manager is to then bring all those ideas together in a coherent whole. Again, all that’s needed is some free wall space covered in dry erase paint. Rather than have your employees scribbling on paper (with a lot of it ending up in the trash), the simple write on the wall and wipe away when finished is a far more environmentally approach. With a dry erase wall, the need for paper can be reduced saving both money and ecological footprint. It also increases efficiency in that there is less of the disorganization associated with paper. Ideas can be shared more easily, (they are all up there for everyone to see) and more work will get done. If you fully embrace the dry erase revolution, you can set aside a wall space in an area where everyone will see it. This space can be used for the most important notices that all employees need to take stock of. This space can be used as an impossible-to-miss center for schedules, minutes, calendars, and reminders. Not only does this give an added dynamic to the workspace, it facilitates communication so that ‘everyone is on the same page’. Finally, by covering your office space in dry erase paint, the entire space becomes a vehicle for ideas. The impact can be contagious on all employees. If you are surrounded by the ideas of others you often cannot help but contribute or be stimulated into offering your own. The sense of unity that this can create within the workspace is difficult to overstate. Overall it will encourage teamwork while also adding some much needed fun to the working environment. Simply adding some dry erase paint to a spare wall can help make that happen.